How Do We Know What We Don’t Know About Asteroids? What does guessing the number of jelly beans in a jar have to do with political polls and counting asteroids? They all have something in common: all three use statistical samples to predict a result. In other words, without having to ask every single person in the country how they’ll vote, it’s possible to pick a group of people who we think are likely to be a good representation of everyone and just ask them how they’re going to vote. From this representative sample, we can predict what everyone else will do. Similarly, we don’t have to count every single jelly bean in the jar to get a good estimate of how many there are. Instead, we can figure out about how big each bean is, and roughly how big the jar is, and from there, we can make a pretty solid guess about how many beans the jar holds. When it comes to asteroids, those bits of rock, ice, and dust zooming around in our solar system, one of the first questions a lot of people ask is how many are there, and how do we know that? We certainly haven’t found all the asteroids yet, so how can we be sure how many there really are, and how many more are left to discover? 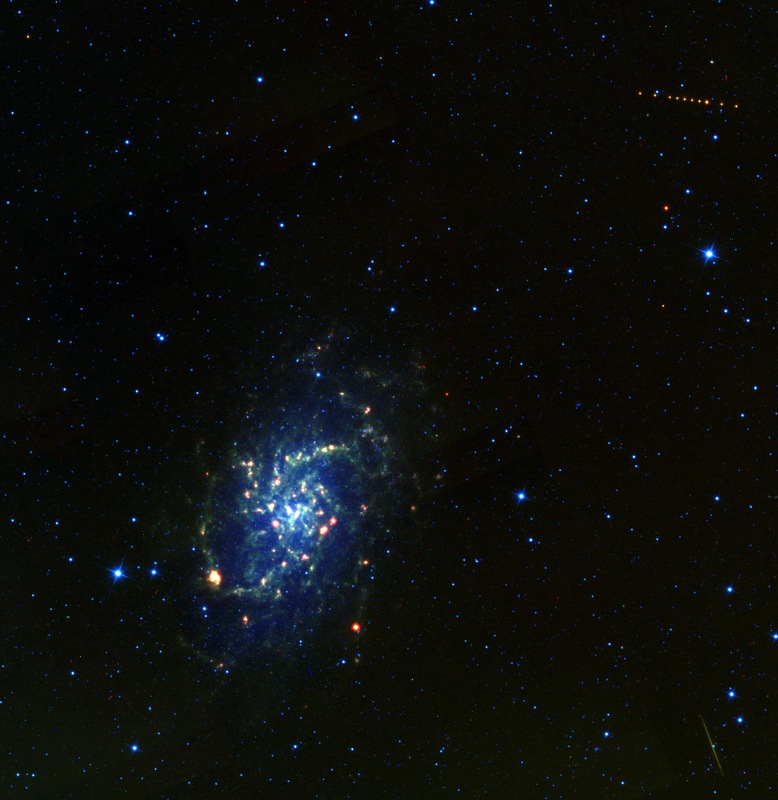 The Wide-field Infrared Survey Explorer (WISE) mission captured this infrared view of an Earth-orbiting satellite (green streak, lower right), the Main Belt Asteroid Regina (which appears as a string of orange dots, upper right), and the Triangulum Galaxy (center left), one of the closest galaxies to our own Milky Way. In this heat-sensitive infrared image, the shortest wavelengths are color-coded blue, and the longest are shown as red. Regina was detected by the WISE’s mission asteroid-finding pipeline, known as NEOWISE. From its infrared signature, we can measure its size and the reflectivity of its surface. Regina is 47 km across, and its surface is as dark as black ink. It appears red in this image because it is much cooler than the stars, which are thousands of degrees. The string of red dots represents the multiple exposures of it that were collected by the WISE spacecraft. The satellite appears as a streak because it is much closer than the asteroid, so it appears to move much faster. Although the galaxy is moving incredibly fast, it is so far away that it appears stationary. Its blue stars are very hot, thousands of degrees, and the red regions highlight the cool, dusty locations where new stars are forming. Credit: NASA. To answer these fundamental questions about our solar system’s smallest members, we turn to a technique that’s pretty similar to the jelly bean jar question: we study a representative sample. In this case, the sample of asteroids we studied came from a NASA space telescope that orbits the Earth. This space telescope has a special feature that makes it particularly useful for learning more about asteroids. Instead of using visible light to make measurements, this telescope uses infrared light, which human beings perceive as heat. Infrared light is part of the same spectrum of light as the visible light our eyes sense, but it’s even redder than the reddest red color that we can see. Asteroids glow extremely brightly at infrared wavelengths because they’re warmed by our sun. This makes them easy to spot with our space telescope, since the infrared light the asteroids put out doesn’t really depend on the lightness or darkness of their surfaces. Dark-colored asteroids can be hard for visible light telescopes to pick out against the blackness of space because they reflect very little visible light, but they look bright to an infrared telescope. So infrared is a great tool for gathering that representative sample that I mentioned, since it’s equally sensitive to light- and dark-colored objects. This heat-sensing telescope began its life as the Wide-field Infrared Survey Explorer mission, or WISE. Its primary mission was to survey the entire sky in infrared light, searching for distant galaxies and rare, ultra-cool stars. However, it is also very good at discovering asteroids, including ones with dark surfaces that are harder for visible light telescopes to spot. Moreover, since it surveyed the entire sky, it was able to detect asteroids in all kinds of different orbits. Infrared light has another big benefit when it comes to asteroids: we can use it to get a much better idea of an object’s true size than we can using visible light alone. With visible light, it can be hard to tell the difference between an object that’s small but very light-colored and highly reflective, and one that’s much bigger but very dark. However, to an infrared telescope, the surface color doesn’t really matter – its infrared brightness depends mostly on its size. For these reasons, the sample of near-Earth asteroids detected by WISE was a good representation of the entire asteroid population. To figure out how many are really out there, we figured out exactly where the telescope looked and when at a patch of sky, and how sensitive its infrared eyes were. Next, we created a simulation of both the telescope and an imitation solar system full of asteroids on a supercomputer. We adjusted the number of asteroids in the imitation solar system until our simulated telescope saw the same number of asteroids that our actual telescope did in real life. This gives us a good estimate of the total number of asteroids that are really out there. We compared the number of asteroids that have already been found to date to the total number, which indicates how many are left to discover at different sizes. What we found is some good news, and some areas where we need to do more work. The good news is that of the really large near-Earth asteroids, those larger than about a kilometer across (capable of causing global damage should they hit Earth), more than about 95% have already been found to date. That means that nearly all of these really big asteroids have now been discovered by the worldwide astronomical community, including professionals and amateurs. For intermediate-sized objects, between 100 meters and 1 kilometer, which are capable of causing regional damage if they hit Earth, our sample showed that there were somewhat fewer out there than previous studies had predicted. However, only about 25% of objects in this size range have been discovered to date, so there’s clearly a lot more work to be done to find and track these objects. And for the many smaller objects, we’ve got our work cut out for us – there are as many as a million, and most of those remain undiscovered at present. However, the systems are now in place to instantly calculate any potential impact trajectories as new observations come in. You can keep track of our latest finds here. We’re also actively monitoring the objects that have already been discovered to firm up our knowledge of their orbits. Meanwhile, NASA gave the WISE spacecraft a new lease on life in late 2013. After the space telescope finished its primary mission of surveying the whole sky, it was placed into hibernation in 2011. But in late 2013, it was turned back on and renamed NEOWISE (which stands for Near Earth Object + WISE). Its new goal is to keep finding and characterizing near-Earth asteroids and comets, including both bright and dark ones. Along with a slew of ground-based telescopes, NASA continues to scan the skies for Earth’s nearest neighbors. 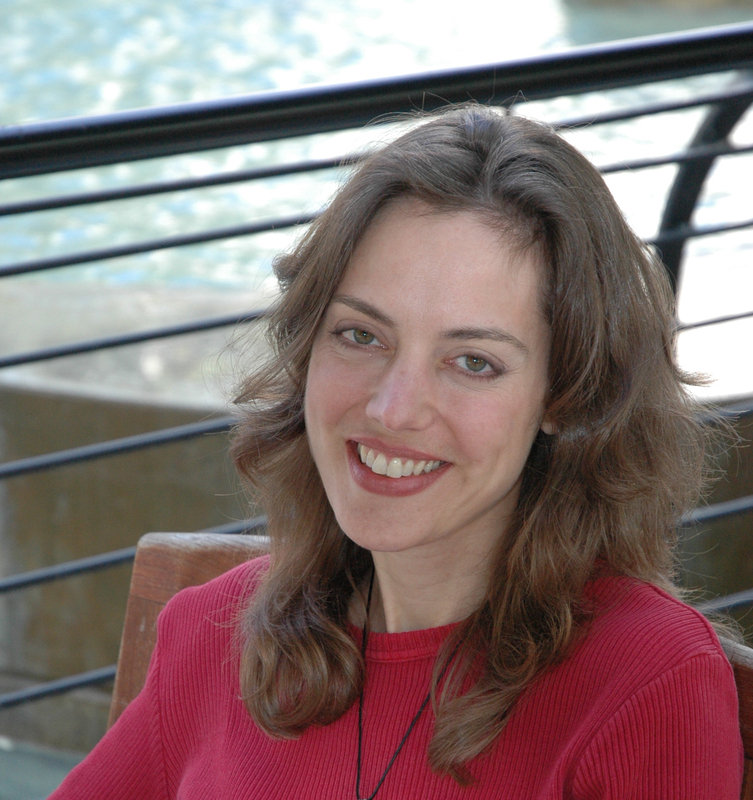 Amy Mainzer is a Senior Research Scientist at NASA’s Jet Propulsion Laboratory, and the Principal Investigator of the NEOWISE mission to survey asteroids and comets. She was the Deputy Project Scientist for the mission during its construction and prime mission phases, when it was known as WISE. Before joining the WISE project, she worked at Lockheed Martin Advanced Technology Center, where she designed and built the fine guidance sensor for NASA’s Spitzer Space Telescope, which is a camera that aligns the telescope’s pointing system. She has also worked on an infrared camera for NASA’s airborne SOFIA observatory. Currently, she is developing advanced infrared detector arrays for future space applications, including finding more asteroids.